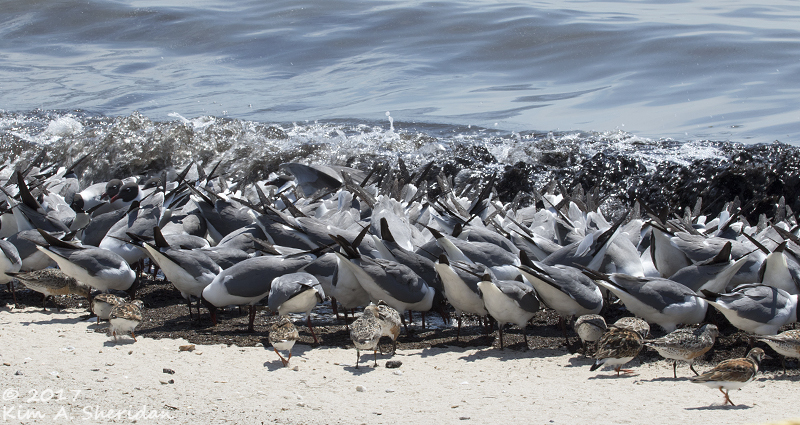 In search of avian wonders out of the ordinary, we turn now to the sparkling shores of the Delaware Bay. A large expanse of sandy beaches and saltwater marshes along the New Jersey side of the bay attracts many feathered marvels. I went to the Bayshore one sunny May day to see migrating shorebirds. I’m easily distracted. A side trip to Cape May Point State Park occupied most of my morning. 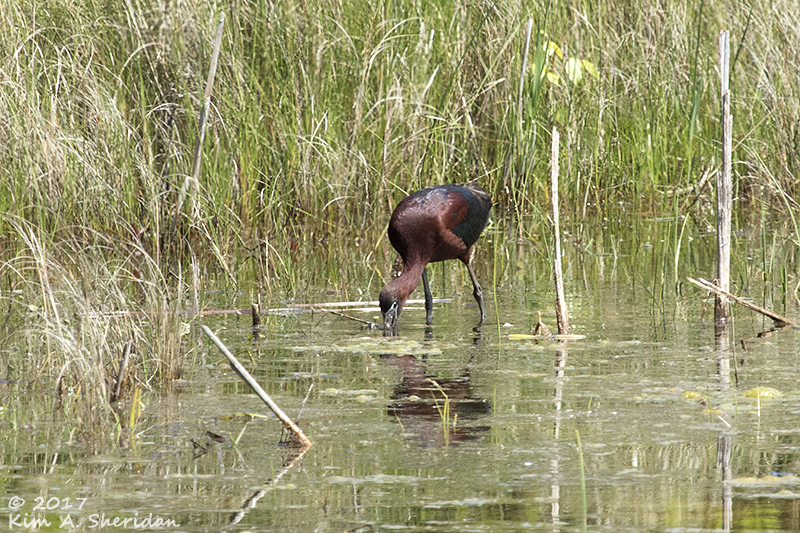 You’d be distracted, too, by the Glossy Ibis I found at the edge of a pond. 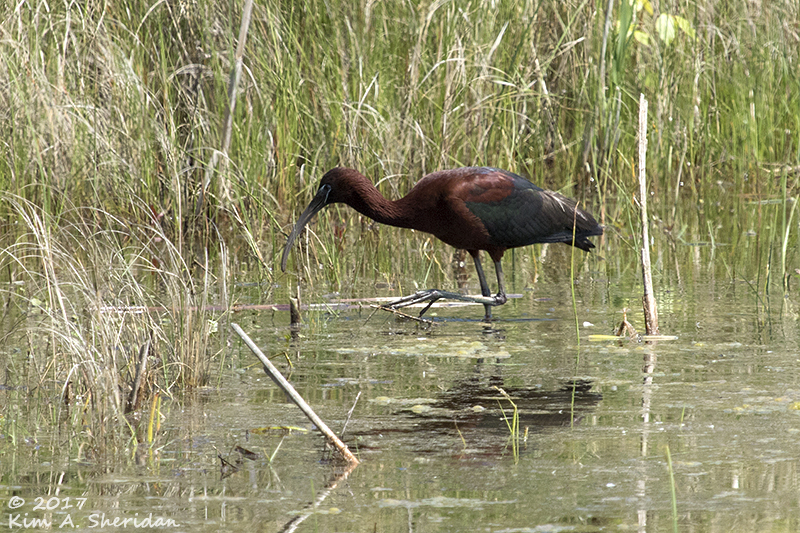 His deep burgundy plumage shimmered in the sun as he stalked, slow and stately, along the shore. Everything about an ibis is long: long legs, long neck, long bill. All the better to eat with, my dear! Distracted again, this time at Heislerville WMA. 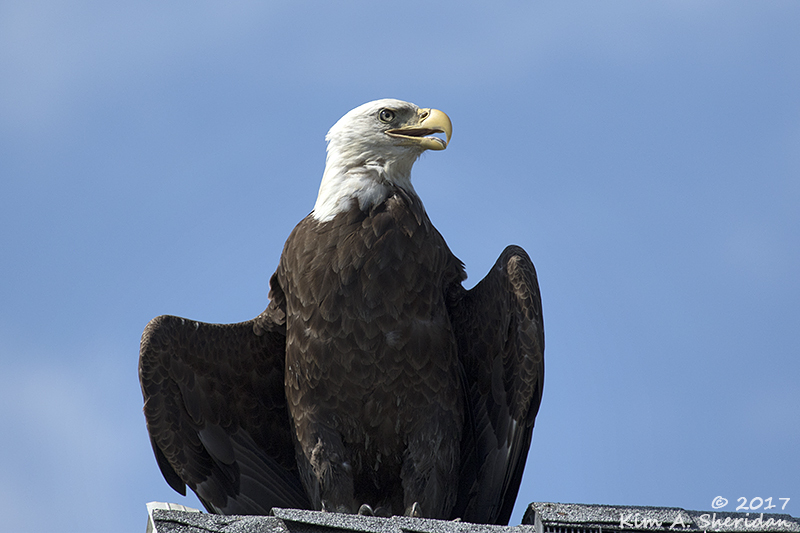 Bald Eagles, once endangered, are now common in some areas of the region. But an eagle posing on the roof of a nearby house? Extraordinary! Alongside the road, a gravel, shell and grass area serves as a parking lot for visitors. 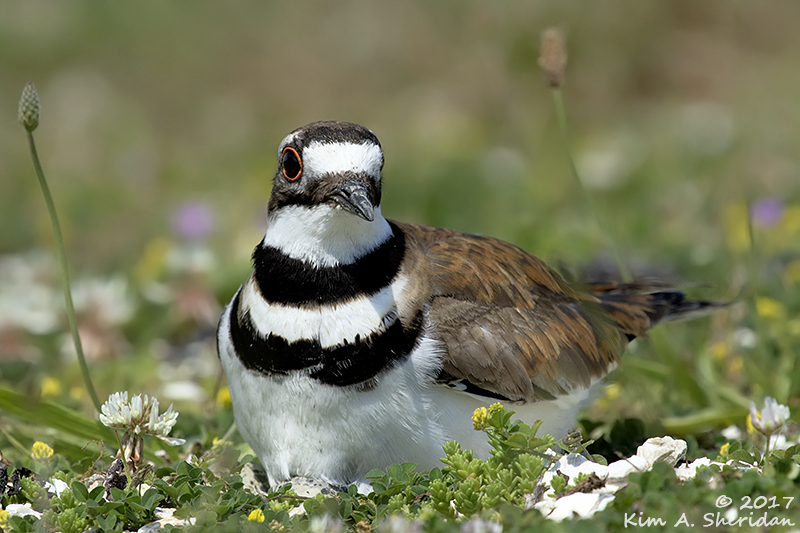 It also serves as a nesting area for the local Killdeer population. We didn’t see this little mother when we pulled in; three feet to the right would have been disastrous. The Killdeer was incubating eggs right there in the parking area. She was none too happy about our near-miss and our presence, so I took my photos quickly and left her in peace. Wait, that’s not a bird! Did I mention I’m easily distracted? 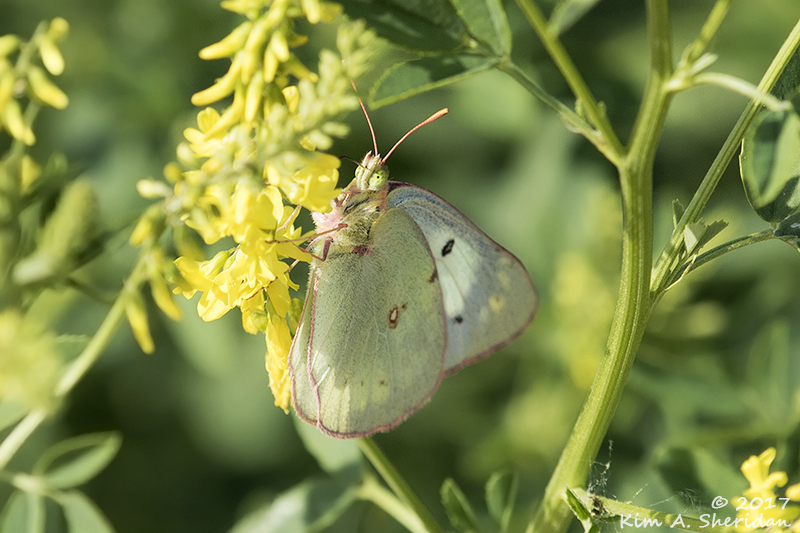 Clouded Sulphur. Well, finally! Distraction-free at Reeds Beach. There was no shortage of shorebirds. And gulls. 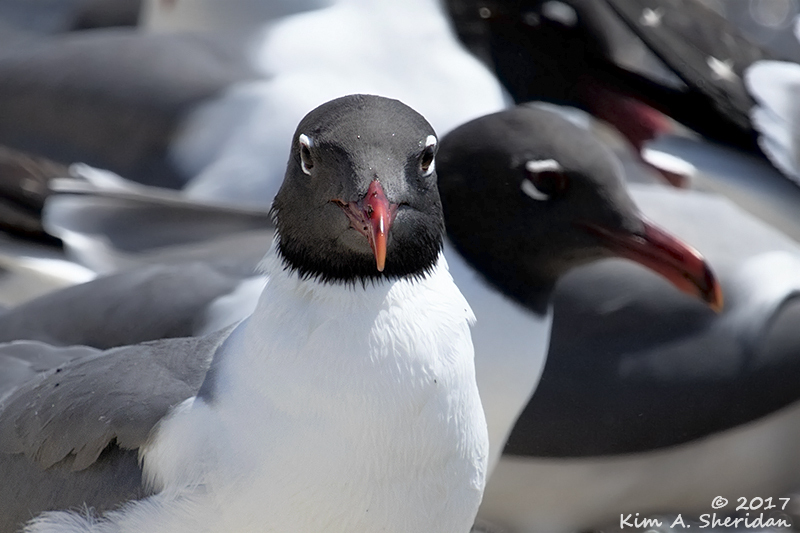 Laughing Gulls are quite common in my neck of the woods. The sheer numbers of them clustered at the water’s edge was extraordinary. Extraordinarily noisy, too. And comical. 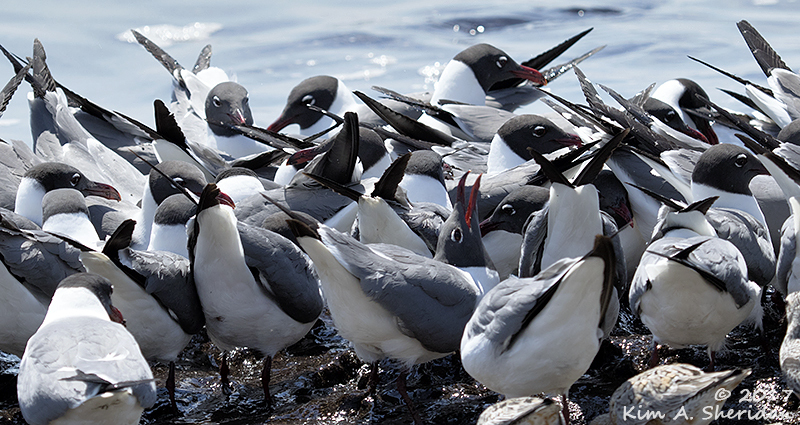 Heads down to feed, the gulls resembled a tail-feathered basket-weave fence. One poor guy in the middle had a complaint. 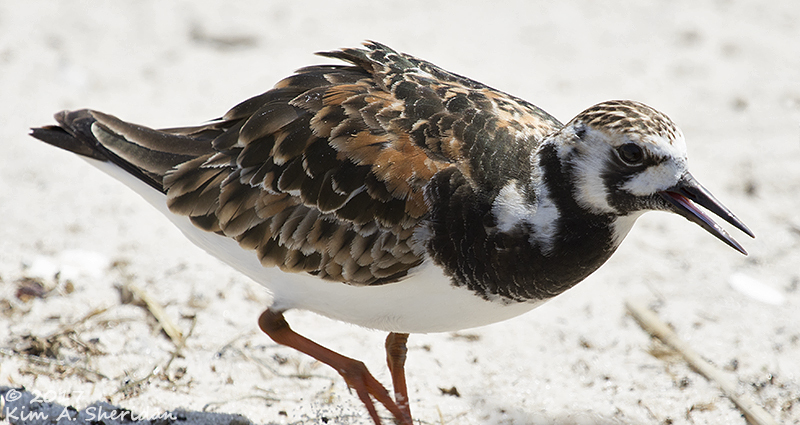 Ruddy Turnstones were dramatic in russet, brown and black plumage. 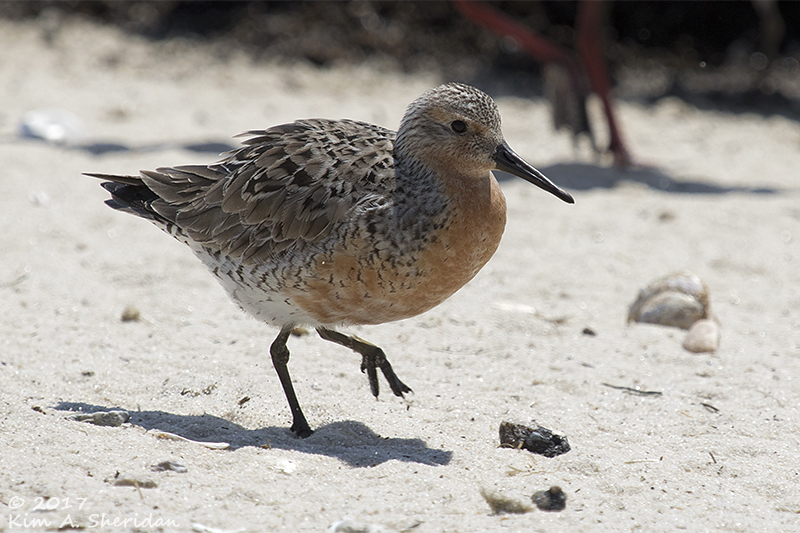 The stars of the show were the Red Knots. This little shorebird travels immense distances every year from wintering grounds at the tip of South America, to breed in the far north. Along the way, having lost much of its body weight to the rigors of flight, it joins other long-distance migrants at the Delaware Bay, to feast upon the fat-laden eggs of the horseshoe crab. Horseshoe crabs come ashore to lay their eggs at the same time the shorebirds arrive. Unlike this unfortunate crab, most remain right side up and survive to breed another year. Their numbers are dwindling though, due to sustained over-harvesting. 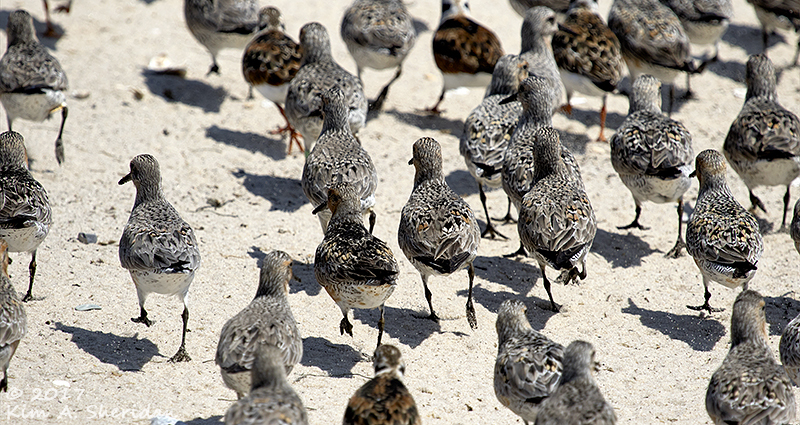 Bad news for the shore birds, especially the Red Knots. Hey, wait! Was it something I said? Come back! And back they come, in a big hurry to get to those eggs. 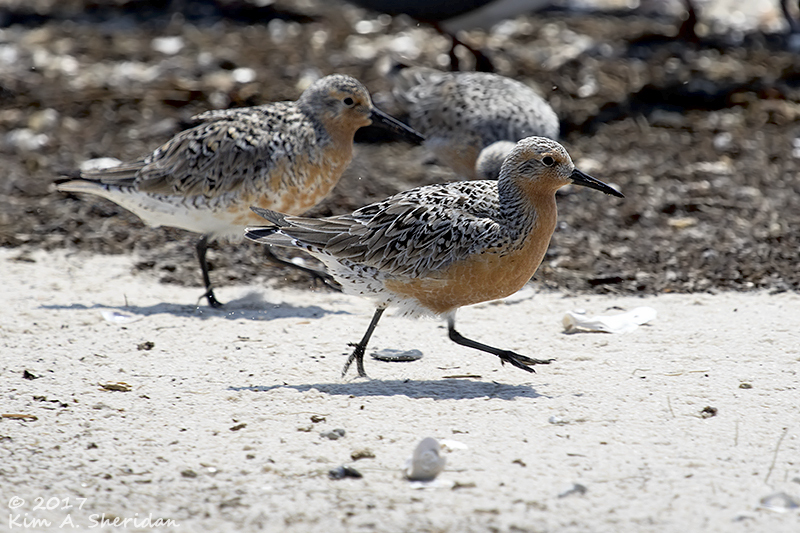 There is concern for a number of shorebird species, but the Red Knot population is in the worst shape. 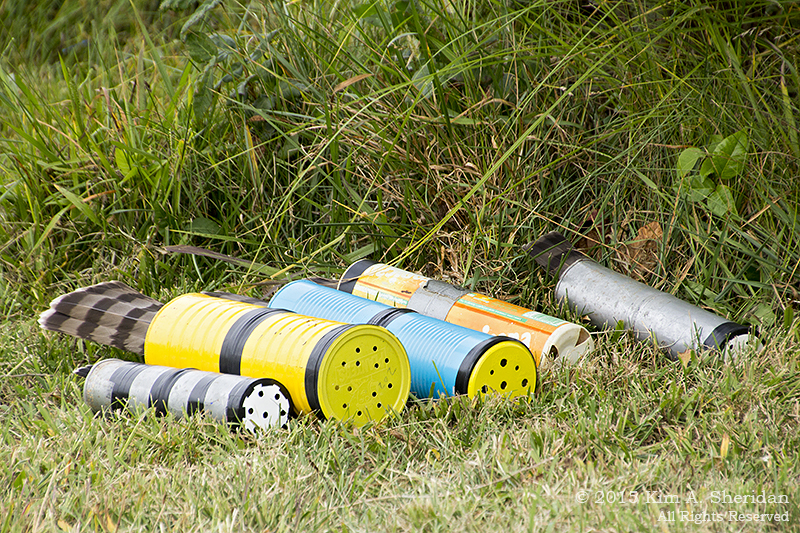 In an attempt to protect and conserve these birds, scientists have been tracking their numbers and movements. Spotters were posted at Reeds Beach, recording band colors and numbers. Only time will tell if conservation efforts succeed or fail. 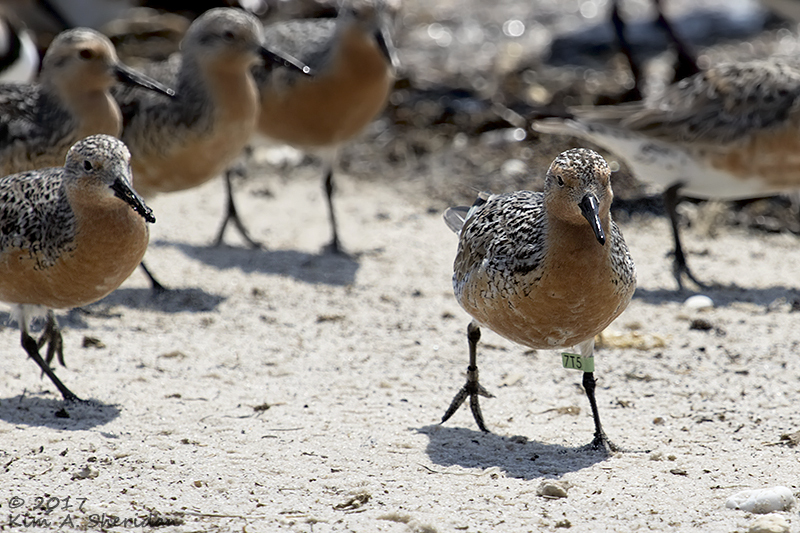 This Red Knot has been captured, weighed and released, and wears some distinctive jewelry to commemorate the experience. Green is the color used for birds in the United States. I saw orange bands as well. Those birds were banded in Argentina! From Argentina to New Jersey, and on to the far north, shorebirds undertake extraordinarily long journeys, twice, every year. 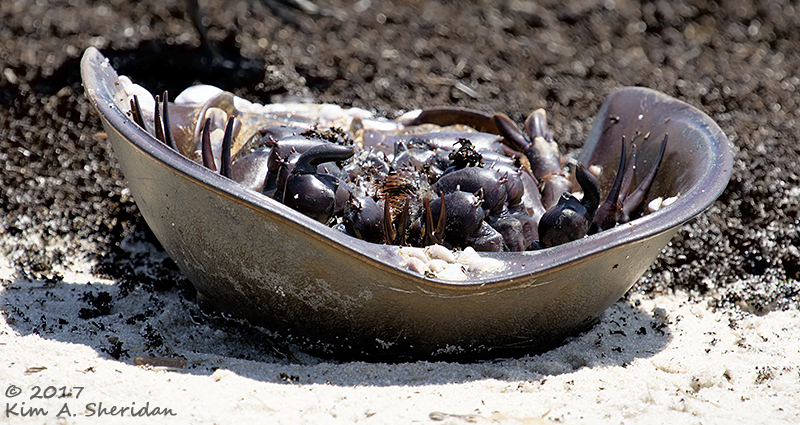 The horseshoe crabs along Delaware Bayshore provide the fuel they need to keep going. 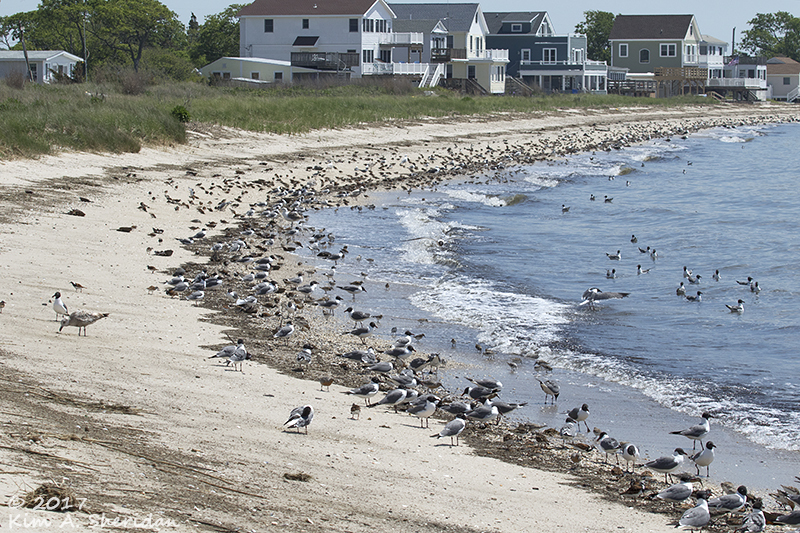 Its sandy shores are the perfect places to savor the wonder of these extraordinary birds. Wildlife photography should always be this easy! 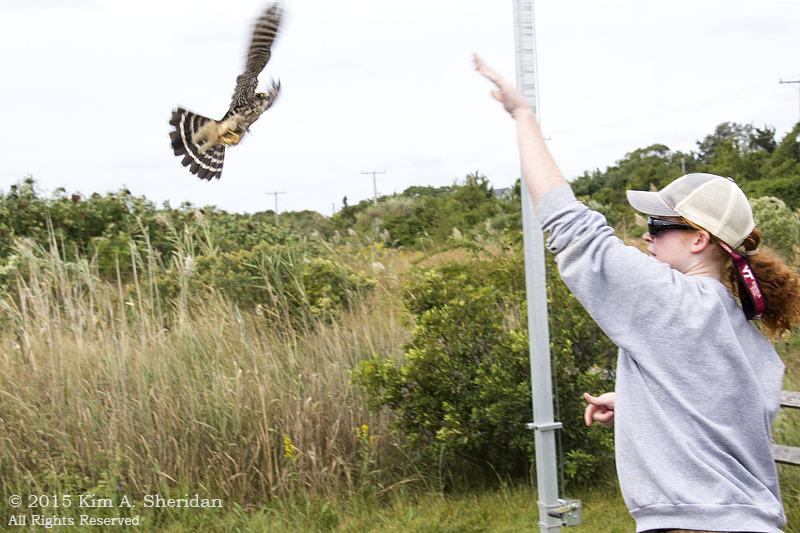 While in Cape May, I stumbled upon a demonstration by the Cape May Raptor Banding Project. 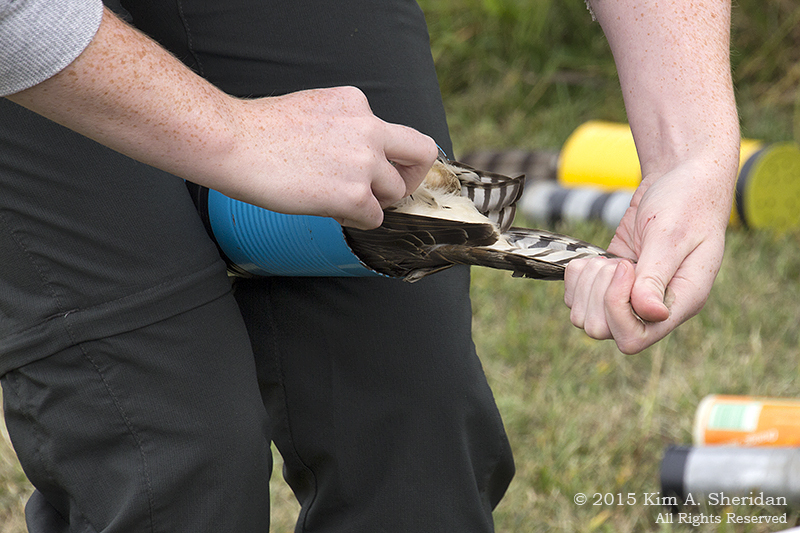 This is a research project that captures, measures and bands hawks at several sites in the fall to study migration. The researchers also meet the public to discuss their work, bringing banded hawks for up close observation. And I do mean UP CLOSE. Usually I’m photographing hawks on the wing in the distance. Occasionally I’ll be lucky enough to see one perched nearby. But here was a chance to see and photograph these magnificent birds 10 feet away – and they weren’t going anywhere! The birds arrived in these tubes. They’d already been measured and banded. The tubes keep them calm. 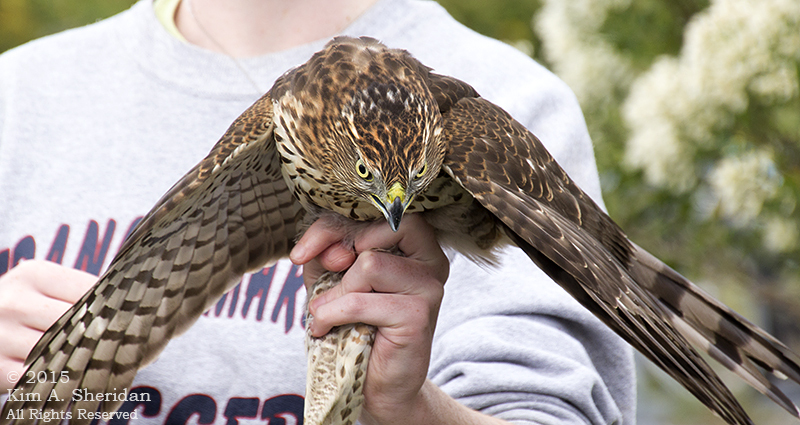 The first birds out were Sharp-shinned Hawks, male and female. After we’d had a good long look at the Sharpies, they were released. Sharpies live in forests; since they pursue their prey through dense stands of trees, they are speedy and acrobatic fliers. It didn’t take long for them to fly out of sight. 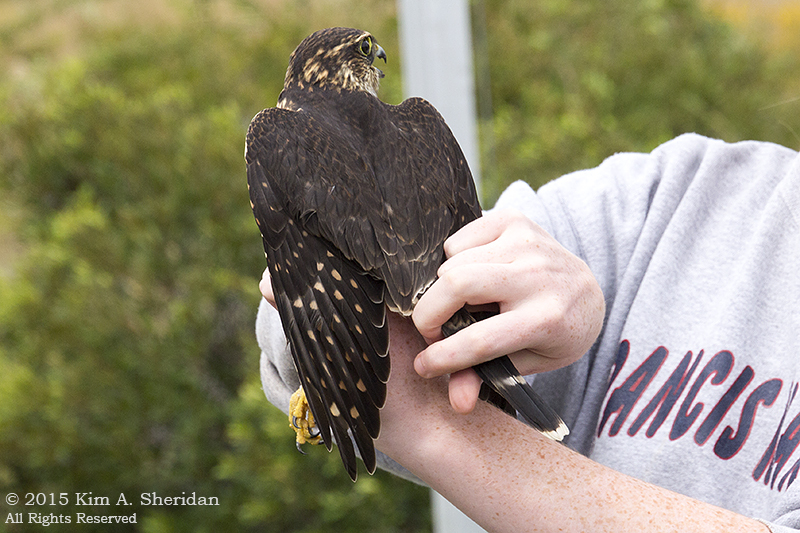 Getting a Cooper’s Hawk out of a travel tube. One of the two presenters was a young college intern. She handled these birds like a pro. Even when they objected. 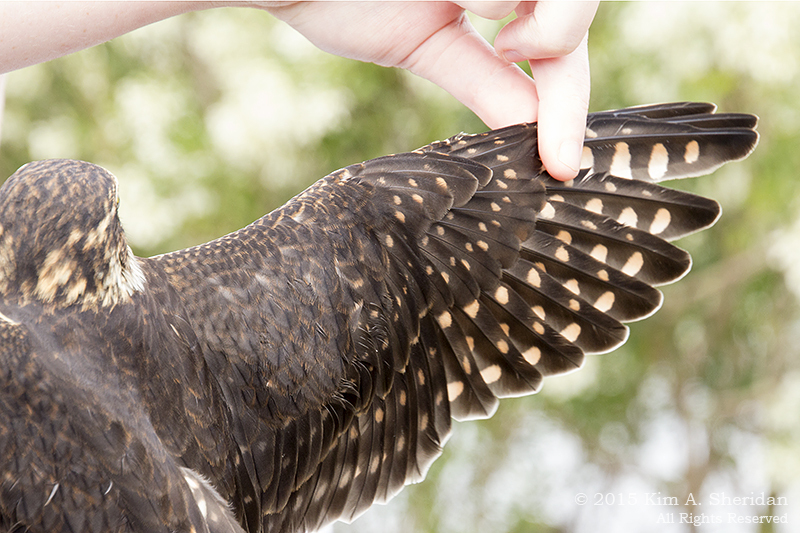 Her free hand is making a motion meant to calm the hawk. Note the talon marks on her left hand! 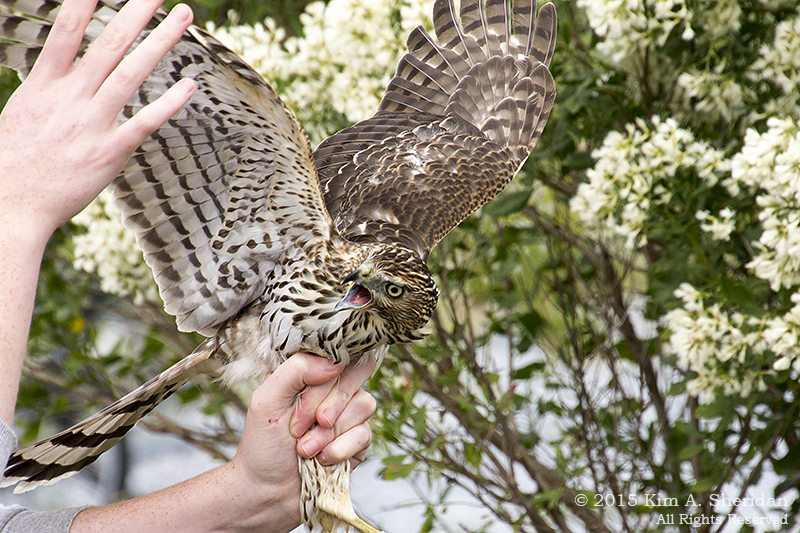 Cooper’s Hawks live in woodlands, but have become quite comfortable in suburban yards. They take an interest in the songbirds on my feeders from time to time. 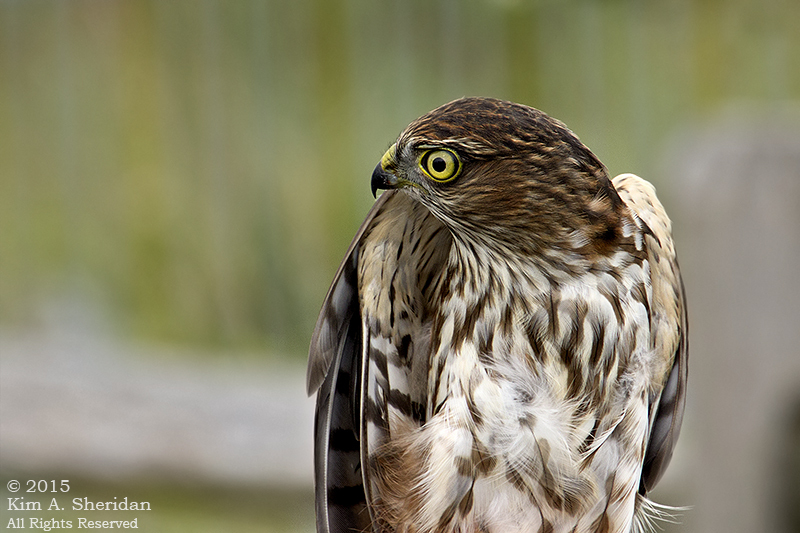 Sharp-shinned and Cooper’s Hawks look very much alike and are difficult to tell apart. Experienced birders talk about differences in tail shape, head size, eye position and other field marks. Cooper’s Hawks are bigger than Sharpies, but this isn’t apparent unless you have two next to each other to compare. 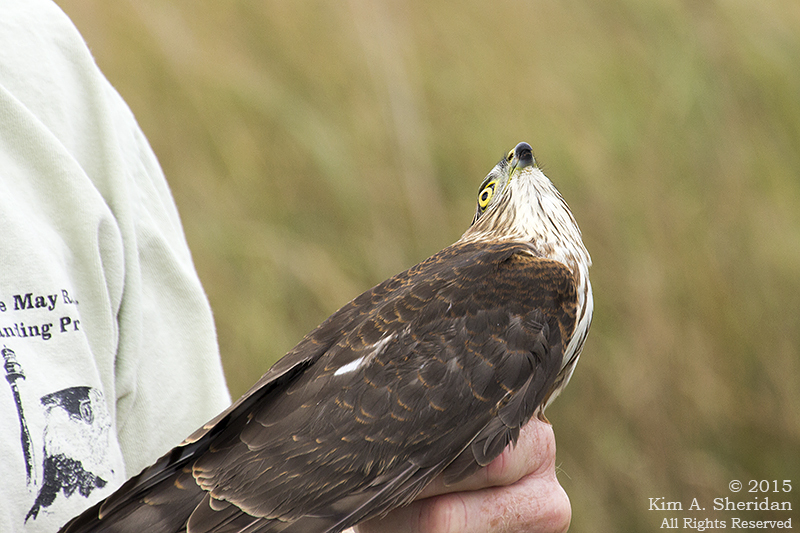 And since female Sharpies are nearly as big as male Cooper’s hawks, it still may not be obvious. This is a Cooper’s, and a big bird, so I think this is the female. 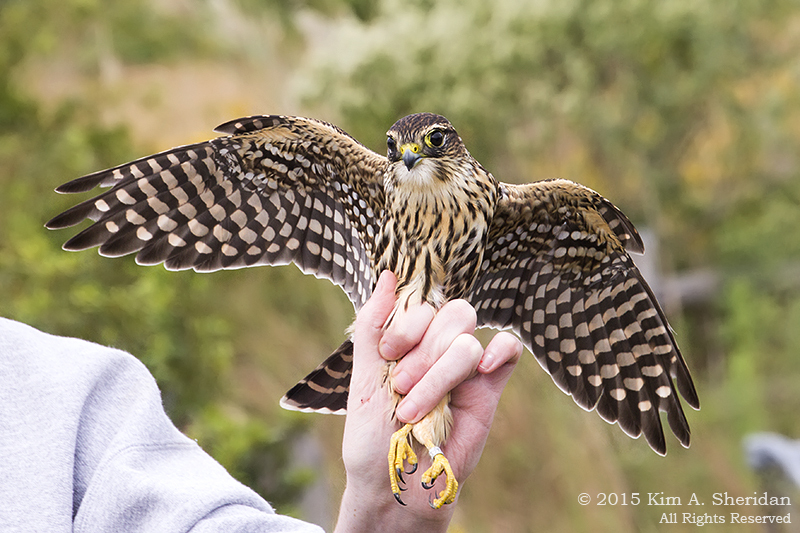 After the two Cooper’s Hawks were released, the last raptor came out to play, a Merlin. Look at those eyes! Quite a contrast to the yellow eyes of the other hawks. 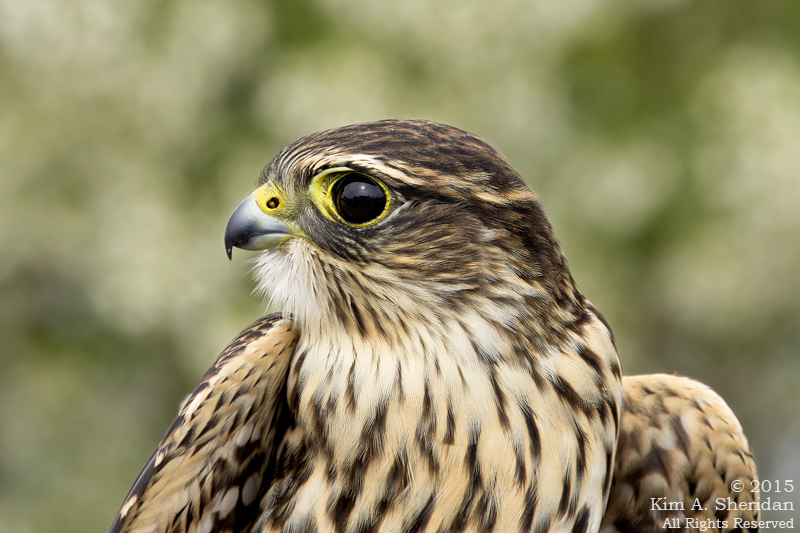 Merlins, in fact, aren’t hawks at all, but falcons. 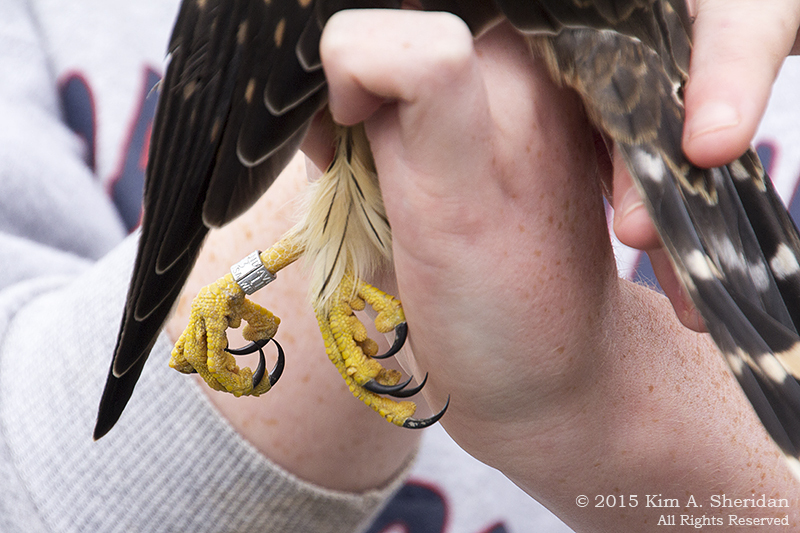 … and the talons, sporting a brand-new band. Understanding the migration patterns of hawks is important in protecting the birds and the habitats they need for survival. And off goes our Merlin! No longer a bird in hand, disappearing over the horizon like magic. It was magical to spend this time with these beautiful raptors.